Pioneer XW-NAS5-R Tabletop Music Player with FM Radio and Bluetooth. Available with Online Finance and Free Delivery. Combining stellar sound performance and exceptional build quality, Pioneer’s XW-NAS5 audio system has been finely tuned and calibrated for optimum sound. Pioneer’s speaker designers spent extensive time sound tuning the system for high fidelity with rich bass, wide frequency response and a dynamic musical sound-field. This Pioneer NAS5 contemporary iPod dock gives users direct access to the digital music you love, delivered straight from your iPod. The Pioneer NAS5 iPod speaker system delivers a true digital quality audio performance. Unlike many of its competitors the NAS5 iPod speaker system does not use a digital-to-analogue conversion, ensuring you receive audio exactly as it is recorded. There is more to the Pioneer NAS5 iPod speaker system than meets the eye. 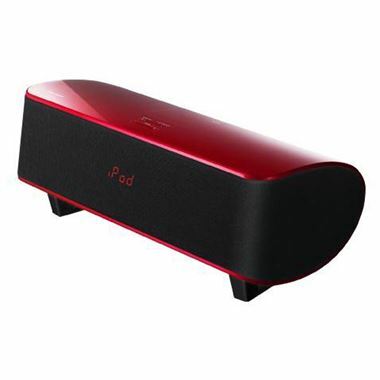 It also includes an Bluetooth adaptor, FM radio tuner and alarm clock system deeming it the perfect bedside accompaniment to any music-lovers’ bedroom. In addition, the XWNAS5 sound system employs component and composite video outputs for playback of stored movies, TV shows and other video files from the docked digital device. The 2.1-channel full-range speaker system of the XWNA5 features a dynamic digital amplifier and integrated subwoofer for faithful reproduction of bass and lower frequencies. For the finely tuned ear, the XWNAS5 also features Pioneer’s proprietary sound enhancement features, including Advanced Sound Retriever (ASR) to enhance the sound of compressed music files and Auto Level Control (ALC) to monitor the volume level from track to tack. Both of these features have been developed specifically to improve the listening experience of portable audio devices in the home.